Valentine’s day is just around the corner. We’re all getting excited over here. 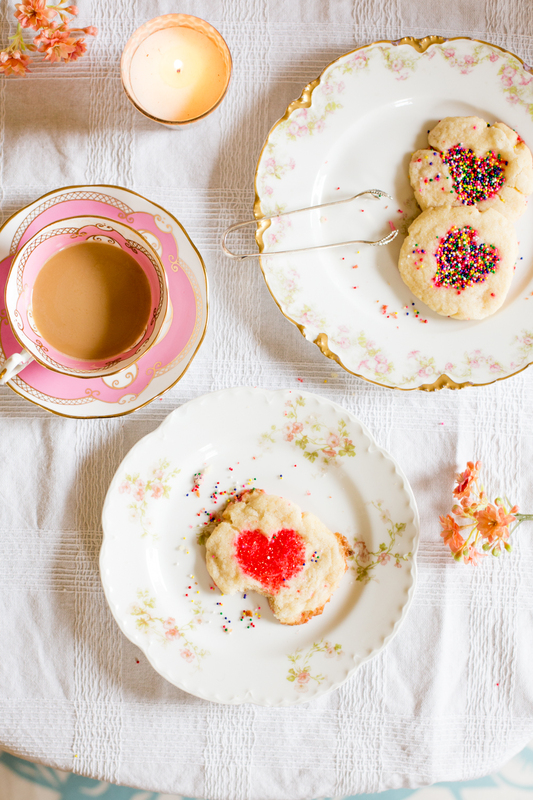 Last weekend, Allie and I stumbled upon this idea to make heart sugar cookies. We wanted to do it without anything special so we cut a template out of an index card and used packing tape to make these happen. We tried it a few different ways until we found something we thought would work. 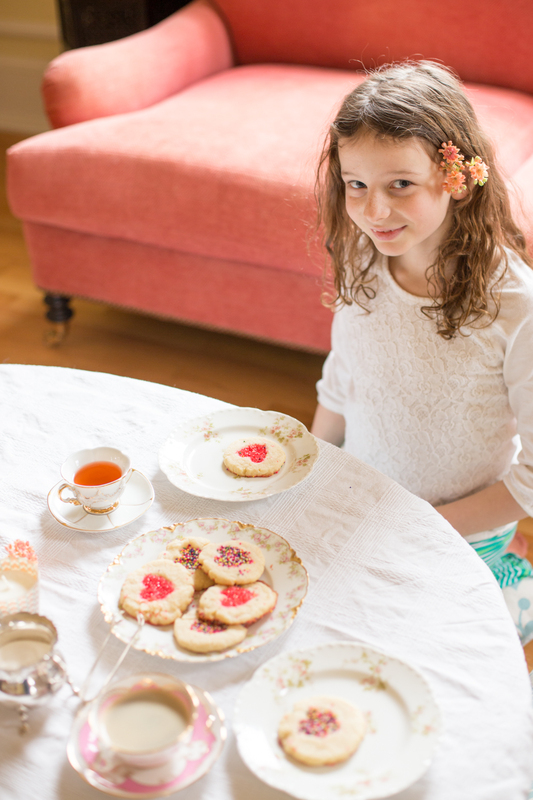 It made our Sunday tea party extra special – I love a little spontaneous creativity! Allie loves tea and loves a party. Let’s be frank, who doesn’t? My Grandmother’s tea cup collection and coffee service are displayed prettily in a breakfront in the living room. For a while after I received the tea cup collection from my Aunt, it just sat there, unnoticed and untouched. When Allie asked one day, can we use those tea cups? My first instinct was to say: No Way! Then, I thought, why not? What fun are they behind the glass, unappreciated and unloved? . . . Now, we have a new tea party tradition. We are very careful. Allie practically squeals each time we go select which cups we will use for our parties. It pleases me to no end that we use them and I think it would please my Grandma, too. The base of the cookies is a simple sugar cookie recipe from Cook’s Illustrated Best Recipe Cookbook. I adore that cookbook and use it for so many things because they test and tweak multiple versions of a single recipe to land on the best one – and then, they EXPLAIN why. I love that. It’s such a great learning tool. 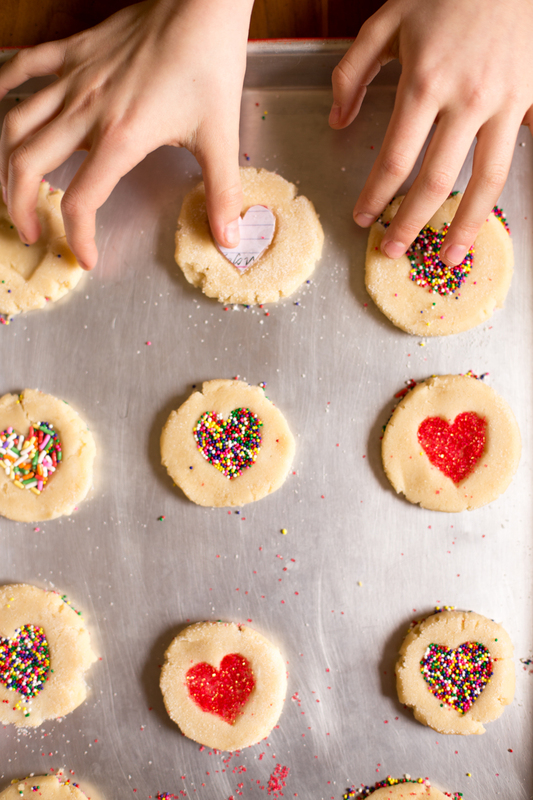 To make the heart sugar cookies, you can use any sugar cookie recipe. You could easily use a stamp to make a depression in your cookies if you have a clean one. But, we decided to go all Macgyver on them. Start by cutting a heart shape out of an index card, making sure to keep both the heart part and the negative space part. You use both parts! We wrapped the solid heart in packing tape and trimmed the tape to match the heart. // Make the sugar cookie dough and press into cookie shapes according to directions. Then, use your heart template to press a heart-shaped depression into each already pressed cookie. // Use your negative space heart template to place over the depression you just made and shake desired topping (red sugar or nonpareils worked the best) into the depression. // Remove the negative space heart. //Brush away any sprinkles that made it underneath the template on to the cookie. Bake and enjoy! 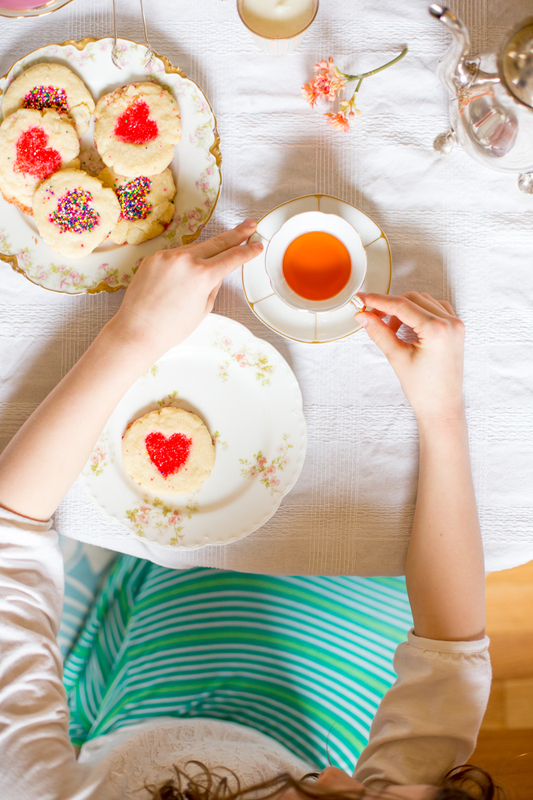 Happy Valentine’s Tea Parties, y’all! Oh, my gosh, what sweet pictures and a great idea to use Grandma’s pieces. It makes your party all the more special, doesn’t it? Love your simple and creative sugar cookies too. Thanks for sharing pics of your tea party. I enjoyed your post so much. Thanks so much Cindy! It really did make our party special. Allie and I are hoping to make it a weekly tradition! I am certain that Allie will carry on this as a tradition in her life. 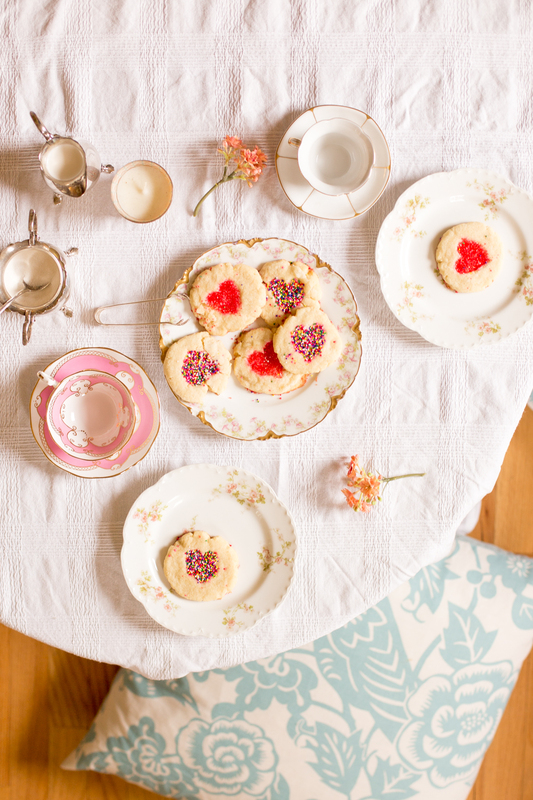 What a COMPLETELY wonderfully beautiful tea party for two. What a sweet, treasured time you are building with Allie. 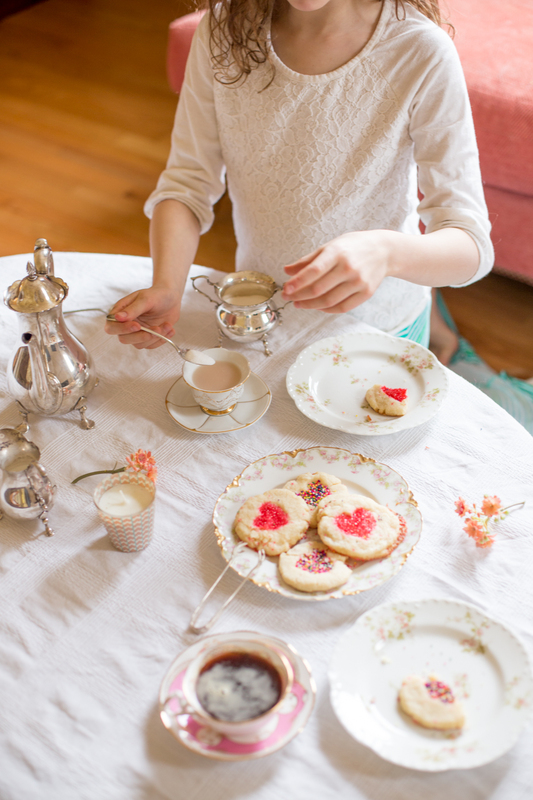 A good friend of mine shared this blog with me as she knows I enjoy teatime too. Thanks so much Lynette – it really has been special. I hope to make it a weekly tradition!